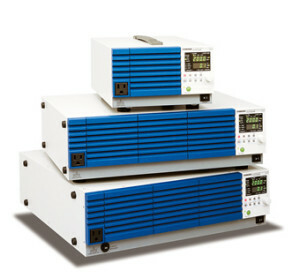 Lab-Power; High Power DC Power Supplies. Telonic Instruments will be exhibiting the latest Programmable DC Power Supplies/ electronic loads from Kikusui and Lab-Power and High-Performance current sensors from Danisense. On the stand will be a small system demonstrating regenerative load testing of DC motors, generators and actuators using kikusui power supply and DC electronic loads. The front panel control features Intuitive operation with variable voltage and current control which can be set and displayed on the high visibility display. In addition to voltage and current, power and resistance can also be displayed. Lab-Power Power Supplies combine their advanced digital control with switch mode technology to give a clean stable output to power today’s most demanding loads. Lab-Power continue to lead the industry in achieving outstanding power densities ensuring the most compact units possible. All Lab-Power Programmable DC power Supplies have been designed and built in Germany to meet exacting standards and have proved highly effective in laboratories, test and production environments, indeed anywhere that reliable power is required. Safety of valuable equipment is assured by an Over Voltage Protection feature: if either the operator of the power supply, or the device being powered exceeds the preset OVP value, the supply shuts down and will not automatically come back on line until it is manually (or remotely) reset. Lab-Power DC Power Supplies are sold exclusively in the UK by Telonic Instruments Limited. Emerging testing options are easing the demands on designers surfing the RF and EMC waves. Faced with a daunting landscape and broader, tougher ranges of testing configurations and standards, wiser companies are accessing newly emerging pathways through today’s new testing criteria. With the budget in mind, we explore these new sourcing options. 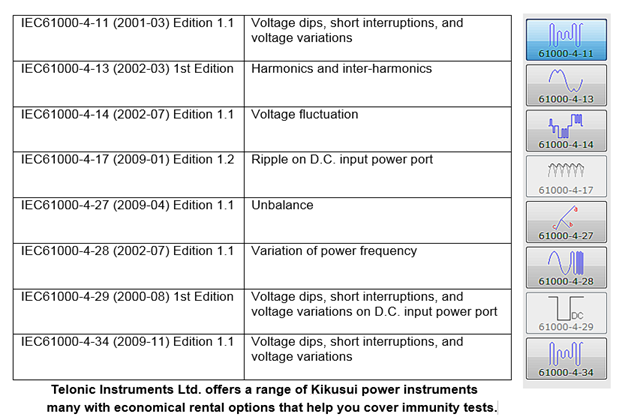 As UK users seek a more acceptable testing cost base, careful selection of spectrum analyser instrument combined judicious use of rental packages can help you tune your in-house test facility to cover line harmonic/disturbance immunity. You can gain economics from in-house testing and help your designers manage risk and reduce the uncertain costs. Designer engineers and production managers have a common interest in tools to help meet the taxing range of standards and test criteria expected in producing today’s complex designs, and to achieve this goal with a toolkit flexible enough to cover the field for the business without destroying profits. “The trends in spectrum test, power test and analysis have led to huge boost in flexibility of tests we can offer” explains Doug Lovell “for example, we have lower-cost automated and programmable spectrum analysers adopted into the design phase, pre-production trials and into automated manufacturing test – in other words a very much wider range of applications and features is expected from the same toolkit”. Telonic Ltd. offer three advantages for EMC: pure performance sufficient to help sniff out problematic emissions (especially low Noise Floor performance), good overall reliability and uncompromised ease of use covering all common kinds of analysis– especially allowing flexible logging of test results. Top end analysers are a daunting alternative – a fully compliant EMC test instrument in accordance with CISPR 16-1-1 can be massively costly. Enter the latest generation of suppliers changing the economics of in-house testing. The latest bonus for economic lab development is with the 2GHz and 3GHz-capable models:DSA1030A and DSA1030 models are available with optional 3 GHz -TG (tracking generator). The A-series’ own built-in pre-amplifier allows up to -148 dBm Displayed Av. Noise Level (DANL), and with advanced standard functions like power measurement, Harmonic Distortion or TOI (3rd order intermodulation) the DSA1030A analysers are ideal for powerful and versatile 9kHz-3GHz measurements. If you need only 1.5GHz, Rigol’s DSA815 and DSA815-TG’s are a very economic price. 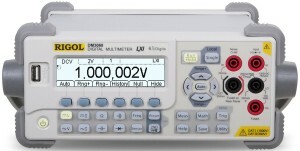 An example of one such second generation spectrum instrument is RIGOL’s DSA-range. Notably, when a RIGOL model DSA815 was subject to the extra hurdle of fitness for EMI Lab via CISPR’ s requirements recently, this budget instrument was found to achieve much of this extreme EMI-Lab oriented standard. Essential pre-compliance for CE and other international standards certifications is now possible at a fraction of the cost. DSA in the RIGOL-UK offerings now add EMI filters, Quasi Peak Detectors to help in-house EMC testing, plus the advanced measurement kit (AMK) as standard on selected models. Telonic is now packing free enhancement specially aiming to help savings on in-house EMC Pre Compliance testing – suited to both conducted emissions and radiated emissions – right up to 3 GHz. For EMC, Telonic also offers an optional ready-to-connect Near Field Probe Set fitting all Rigol DSAs, Line Impedance Stabilisation Network (LISN) and the new TeKBox Tem Cell for conducting radiated emission tests. Keeping a close eye on peak current drain is an important requirement for engineers, whenever you need to manage to a tight power budget. RIGOL’s DM3068 offers several features to help monitor over time. RIGOL DM3000-series – see the video below – all come with very capable MATH and STAT functions which will easily keep data like Max Current Drain displayed on-screen. These and other computed functions can be used on any measurements: Volts Amps Ohms as needed. There’s also a neat front-panel TREND line, with MAX & MIN figures still shown and a smart split-screen so you can easily see a zoom-view of the most recent changes. Today’s engineers often need demanding measurements over long time periods and over unpredictable sequences of operation. Telonic Instruments Ltd’s video shows the quick and simple set up needed to activate RIGOL’s powerful monitoring and tracking functions. The PCR4000M, a 4kW variable frequency AC power supply, has been made available by Kikusui’s UK Distributor Telonic Instruments. 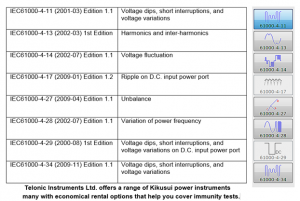 The power supply expands Kikusui’s exisiting PCR500M, PCR1000M, PCR2000M and PCR4000M variable frequency (40-500Hz) AC power supplies. The PCR4000M features AC, DC and AC+DC output, memory function, current limit and selectable start phase. Users are able to measure not only voltage, current and power of the AC and DC output, but also apparent power, reactive power, power factor, crest factor and current peak hold. Equipped with an RS-232C interface, the device comes complete with control/logging software as standard. A number of options are available including GPIB, USB and an analogue input card which allows the frequency converters to be used as power amplifiers. Applications for the PCR4000M include avionics testing (400Hz 115VAC for seating, cabin electronics and audio visual products), measuring power factor on LED lighting and power adapter testing to simulate real world power conditions. The PCR500/1000/2000M and 4000M are available for both purchase and hire from Telonic Instruments. Telonic Instruments has two high performance, higher frequency spectrum analysers, the DSA832-TG and the new DSA875-TG that push RIGOL’s DSA800 series to 3.2GHz & 7.5GHz, respectively. The spectrum analysers are available with Tracking Generator options up to 7.5GHz offering powerful and broad ranging features including options for VSWR measurement toolkit for configuring and evaluating antennas. They also feature an advanced measurement kit (DSA800-AMK software) with numerous additional measurement functions including T-power, channel boundaries and CNR noise ratio. New accessories include the 8GHz VSWR bridge or directional coupler (VB1080 2-8GHz) plus accessory packs for 75 Ohm work (RF CATV Kit), and attenuator sets for higher power work including the RF Attenuator Kit which includes 6 and 10dB attenuators or the model ATT03301H 30 dB high power attenuator. 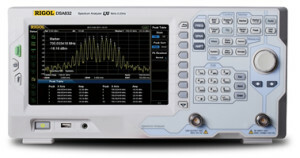 Designed so you achieve Wi-Fi, Bluetooth, and many new comms/RF standards – SSB Phase Noise is down as low as -98 dBc/Hz (@10 KHz) – these new specs enable engineers to more accurately analyse modulations and noise surrounding their signals for increasingly critical debugging and immunity testing of transceiver systems. Using the 7.5GHz instrument, engineers can investigate the 3rd harmonic for all 2.4GHz applications. Additionally, resolution bandwidth settings down to 10Hz mean more precise visualisation of low power RF signals. Using the instruments’ EMI-DSA800 option, designers can enable the EMI RBW settings and the Quasi-Peak filter across the entire spectrum of interest for compliance and immunity testing. The new preamplifier option (PA-DSA832 or PA-DSA875), assists with finding and evaluating even extremely low power issues. With this option, the displayed average noise level (DANL) normalized to 1 Hz is specified as low as -161 dBm (typical) from 5MHz all the way to 3.2GHz. A new EMC Probe set for pre-compliance testing from TekBox is available at Telonic Instruments. 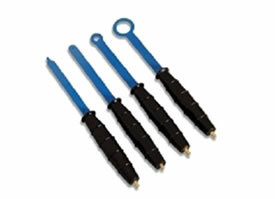 This EMC Probe Set contains 3-off magnetic (H) field probes, 1-off electric (E) field probe, an adapter and RF cable. The H20, H10, H5 and E5 are magnetic field (H) and electric field (E) probes for radiated emissions EMC pre-compliance measurements. The probes are used in the near-field of sources of electromagnetic radiation. They serve to locate and identify potential sources of interference within the building blocks of electronic assemblies. The probes act similar to wideband antennas, picking up radiated emissions from components, PCB tracks, housing openings or gaps and from any other parts that could be emitting RF energy. Scanning a probe over the surface of a PCB assembly or housing quickly identifies locations which emit electromagnetic radiation. By changing to a probe with a smaller size, the source of the emissions can be narrowed down further. The probes can also be used for for RF immunity tests, by feeding a RF signal into the probe and radiating it into potentially susceptible areas of the circuit. Furthermore, the probes can be used for repair or debugging, to track down issues in RF circuits by non-contact measurement of RF signal levels. Features include a slim design for good access in between tightly spaced components, shielded loops to avoid picking up common mode noise; insensitive to the human hand, a frequency brange of 3GHz, though they can be used well beyond, SMB connectors to avoid twisting the RF cable when scanning DUTs. The probes are insulated with rubber coating. 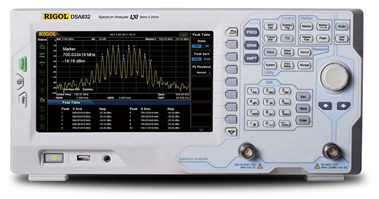 The DG1000Z series of arbitrary/function waveform generators from Rigol help engineers to accomplish a wide range of testing applications by combining many functions in one easy-to-use instrument. Functions include arbitrary waveform generator, function generator, pulse generator, harmonic generator, and analogue/digital modulator. The instruments, now available at Telonic Instruments, also incorporate Rigol’s Direct Digital Synthesiser (DDS) technology, ensuring that signals are delivered with stability, precision, purity and low distortion. These arbitrary waveform generators with innovative SiFi (Signal Fidelity) can generate arbitrary waveforms point-by-point and allow precisely adjustable sample rates and low jitter (200ps). The arbitrary waveform memory is available with 8 Mpts (standard) and 16 Mpts (optional). Two full functional channels can be used as two independent generators offering ±1 ppm frequency stability and -125 dBc/Hz phase noise. The instruments have a built-in 8 orders harmonics generator and a built-in 7 digits/s full function frequency counter with 200MHz bandwidth. Users can choose from up to 160 built-in waveforms with 14 bits vertical resolution and can benefit from a convenient arbitrary waveform editing interface. Versatile modulation types include AM, FM, PM, ASK, FSK, PSK and PWM. 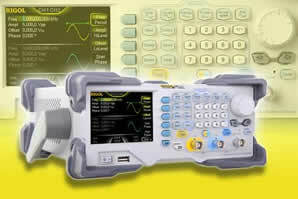 The instruments offer standard interfaces USB Host & Device and LAN (LXI Core Device 2011) and a 3.5“ TFT colour display. All models are supported by the Ultra Station PC software tool. Telonic have introduced to the UK market the Kikusui KPM1000 Power Meter, it was designed primarily for measuring the standby power of consumer and commercial products. The KPM1000 accurately measures low level single phase standby power and higher power levels too. Over the past few years, each region of the world has been putting their effort in to establishing regulations related to efficient design such as ErP Directive in Europe, Energy Star in the US, Top Runner Method in Japan. The KPM1000 complies with standard IEC62301 (Household electrical appliances – Measurement of standby power) and it is capable of measuring the standby power consumption required by the ErP Directive Lot6. The KPM1000 is a compact, light-weight, low priced power meter equipped with RS-232C as standard; both GPIB and USB are offered as options. Features • Voltage range 150V/300V/Auto range • Current range 5mA/ 10mA/ 20mA/ 50mA/ 100mA/ 200mA/ 500mA/ 1A/ 2A/ 5A/ 10A/ 20A/ Auto range • Measuring items Voltage, Current, Active power, Apparent power, Reactive power, Power factor, Phase angle, Frequency, Accumulated current, Accumulated power, Positive direction accumulated power, Negative direction accumulated power, Accumulated time, Voltage crest factor, Current crest factor, Voltage peak, Current peak • High precision measurement Basic accuracy of the Voltage, Current, Power ±(0.1%reading+0.1%range). Capable of measurements with Crest Factors UPTO 6, it can also measure the precise RMS and PEAK values too. • Controlled by the PC The dedicated application software enables you to control the KPM1000 through the PC as same as panel operation. Furthermore, the long-term data can be acquired just like a data logger. • Displays 4 items of data No need to switch over the measuring items, it displays four measuring items at the same time. Kikusui’s new fuel cell impedance meter KFM2030 is intended to enable the impedance characteristics of a fuel cell to be measured easily through the use of the AC impedance measurement method. KFM2030 New Kikusui fuel cell impedance meterUsing the application software that comes with it, the meter can obtain impedance values at different frequencies by means of AC impedance measurement and display the obtained values in a Cole-Cole plot. With a low-power DC load (60 W) built in it, KFM2030 supports fuel cell load testing at up to 20 V, at up to 30 A. Two constant current modes ranges for the load rating: 30 A and 5 A Load current setting resolutions of 1 mA (30 A range) and 0.1 mA (5 A range) are available, with maximum power consumption of 60 W.
Undervoltage protection, overvoltage protection, overpower protection, overheat protection, overcurrent protection, and line cut detection are supported. The backlit LCD offers enhanced visibility. Four types of measurement value can be chosen for display freely from R, X, | Z |, ? , V, and I. Equipped with GPIB, RS-232C and USB interfaces as standard. Impedance measurements can be made in the range of 10 mHz to 10 kHz as well on both primary and secondary cells.